For the perfect proposal, choose this shimmering 2/5ct diamond solitaire, delicately presented in an illusion setting to enhance its radiance and sparkle. 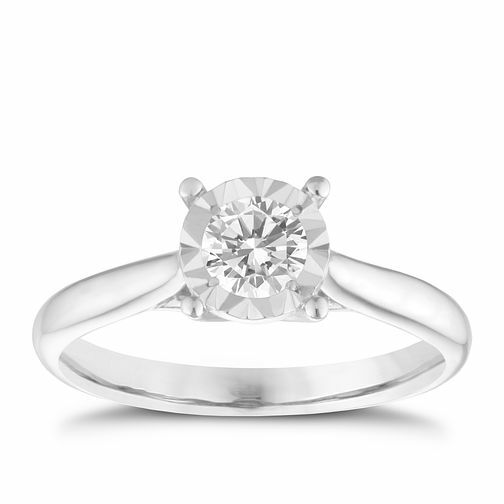 Crafted in gleaming 9ct white gold, this classic solitaire is beautifully eye catching. 9ct white gold 2/5ct illusion set diamond ring is rated 1.0 out of 5 by 1. Rated 1 out of 5 by Anonymous from BROKE WITHIN 9 MONTHS!! My partner proposed (and bought the ring) in March 2018 and a few days ago the top part of the ring came out of place. After taking it to a specialist jeweller, they told me I hadn't broken the ring, that's the way it is manufactured as the top part clips into the lower part. For a reasonably expensive ring, it has been upsetting for both my partner and myself to try and get it fixed whilst on a long term trip to Australia.